If you're active on any major social networks, then you know just how much people love to post selfies. Want to make your selfies (or even bothies) better? Check out these 15 amazing selfie apps by browsing through the follow slides. Offers more editing features than most similar apps. Extra tools and filters are pricey. Having trouble capturing that perfect selfie under great lighting that brings out all your best features? If so, you may want to try Facetune -- a selfie editing app that's just like Photoshop, but without all the complicated tutorials and editing tricks you need to learn first. Facetune's intuitive interface lets you smooth out your skin, whiten your teeth, reshape your jawline, emphasize your eyes and so much more. It's really one of the best apps out there if your main priority is to look your absolute best. Since it's a pretty advanced app, it's not available for free. You can get it for just about $4.00 though from both the iTunes App Store and Google Play. Perfect365: Give your selfies a makeover. Lets you experiment with different makeup brands without buying makeup. Photos can look natural and unaltered with careful editing. Most of the pre-made settings make you look clownish. If you're a female who loves to take selfies, you may already know just how hard it can be to capture how great you really looks on camera. Perfect365 is an app that can fix that. The app lets you give yourself makeovers with a tap of your finger. You can select styles that give you an everyday look, a chic look, a romantic look and more. If you want to fix any specific features like your hair, lips or skin, you can do that too. It's even been reported that Kim Kardashian is a huge fan of this app for editing her selfies. You can get Perfect365 for free for iOS, Android, and even Windows Phone devices. Delivers on what it promises to do. You can make some interesting collages. Pro version only comes with 12 background templates. You can't leave the editing screen without saving or closing the app. Cloning has become a really cool new selfie trend. When done just right, it can look really awesome, and you can clone yourself two, three, four or more times! Split Pic is one of the best cloning apps out there. Not only does it let you clone your selfies, but it also lets you rotate them, flip them, and fade them into other photos for an extra cool effect. You can get Split Pic for free for both iOS and Android devices. You can purchase packs of extra filters. Interface is perfect for iOS devices. Want to blow your social media friends and followers away with some really freaky editing effects? Lensical turns your regular selfies into amusing, yet totally real looking transformations. You can turn yourself into an old man or woman, give yourself a beard or a mustache, and see what you'd look like if you were bald. When you're all done, you can instantly share them to your favorite social networks. Lensical is available for free for iOS devices. French Girls: Get drawings of your selfies. You can commission artists to make professional digital paintings for you. Excellent platform for artists to connect with each other. Learning how to draw on an iPad or iPhone takes patience. The French Girls app turns selfie-taking into a game. If you remember Draw Something, it's a little like that -- but with selfies instead of descriptions. You take selfies, and other users of the app will draw them for you. Conversely, you can draw selfies of other people and send them back when you're done. You can get French Girls for free for iOS devices only right now from the iTunes App Store. CamMe: Go hands-free when taking selfies. Allows you to fit everyone into group shots. Seamlessly transfers photos to your library. You can only take pictures with the front-facing camera. No filters or editing features. 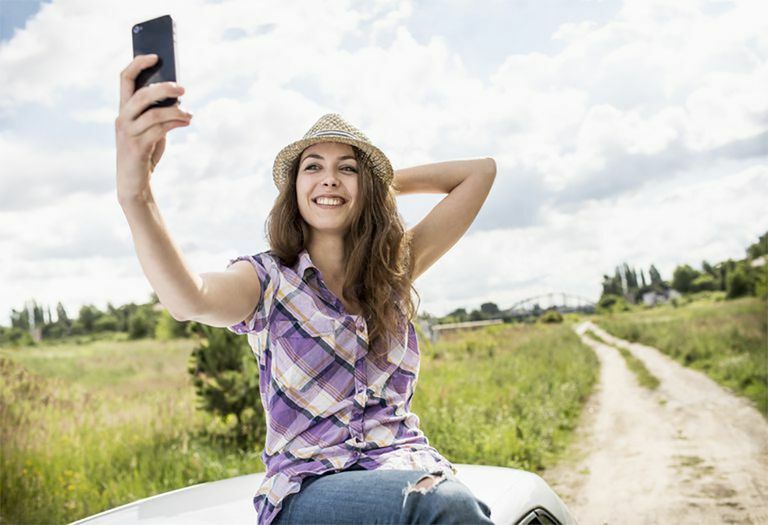 The typical selfie is usually taken by holding your smartphone in one hand and extending your arm out to get the shot. That arm can look pretty awkward when it shows up in the photo sometimes. CamMe helps solve that problem by giving you a hands-free selfie option. You can set up your device, stand in front of it at a distance, and then use hand gestures to signal the app to start taking photos. Great idea, right? CamMe is available for free for iOS devices only at the moment. Frontback: Take a selfie with both your front and back camera. Social media integration makes sharing photos especially easy. Works well with a wide range of devices. Forces you to sign up using an existing social media account. Both cameras can't take pictures simultaneously. Most mobile devices come equipped with both a front and back camera. Ever wondered how cool it would be to snap a photo from both of them at the exact same time? Frontback lets you do just that! Share exactly what you're looking at, plus your face as you're looking at it with this app before posting it for the whole community to see. Frontback is built to be like a social network, so you can follow other friends and even react to their posts by leaving them a five-second video. Frontback is available for free for iOS and Android. Pixtr: Give your selfies a professional touch-up. Still waiting for an Android app. If you're on the hunt for apps that give you really professional looking makeovers, then Pixtr may be the one you're looking for. The app uses advanced facial feature detection technology to transform your selfies and make you look your best. You can use Pixtr to sculpt your face, smooth out your skin, remove blemishes, get rid of shine, whiten your teeth, add some color to your lips and so much more. When you're done, you can easily share your finished selfies to Facebook, Instagram, Twitter, WhatsApp and email. This is one of those premium apps that's not free, but worth the small purchase. You can get Pixtr for iOS with a version for Android coming soon. Animal Face: Turn yourself into a wild animal. Nice selection of animal faces. Forces you to crop images into a square. Do you have a wild side? Animal Face is a really cool little app that turns your head into a tiger, panda bear, lion, jaguar or other exotic animal of your choice. Besides adding a very interesting new look to your selfies, you can even use the app to apply filters, add frames, and use the draw tool to better blend your animal face into the photo. Once you're done, you can share it on all your favorite social networks. Get Animal face for free for both iOS and Android. YouCam Perfect: Edit your facial features. The image quality is slightly diminished after editing. If you're not ready to invest in any of the premium makeover or facial feature editing apps listed here already, but still want something to perfect your selfies, you might want to try YouCam Perfect. This app offers a range of editing tools specifically for perfecting your facial features. It even works for group shops with multiple people in your photo. Reshape your face, enlarge your eyes, lengthen your legs to look taller, and do so much more with this incredibly versatile app. YouCam Perfect is free! You can download it for iOS or Android to start using it right away. Picr: Take a selfie every day to create a time lapse. You can add custom music to your time lapse videos. Grid and overlay features are helpful for positioning. You may sometimes lose photos after updates. Interested in seeing yourself change over time in just a few seconds? With Picr, you can make it happen. The app reminds you to take a daily selfie so you can create amazing time lapses. This would be a great app to use if you have kids, so you can watch them grow up in just seconds once you've taken enough daily photos to create your time lapse. You can get Picr for free for your iOS device.